As well as being part of the tour operating team at Africa Direct, where he is famous for planning spectacular journeys around Africa, Mike Karantonis heads up the Specialist Safari division. He is a specialist game ranger that has been guiding for 15 years in all parts of Africa and is now dedicated to privately hosting safari tours around Africa with his guests. He was based at Phinda Private Game Reserve as a Specialist Ranger for CCAfrica/andbeyond until the end of 2008. Mike, his wife Lisa, and their two young children, Kira and Josh, now live in White River, a mere hour’s drive from their beloved Kruger National Park, which is where you can find the whole family during any vacation time! Mike has wanted to be a game ranger since the age of eight! After school he obtained a prestige diploma in game ranging and private lodge management. He slowly worked his way through the ranks and qualifications and after four years’ of guiding he was appointed Head Ranger of Phinda Forest and Vlei lodges. His qualifications also include being a trails guide, bird guide, canoe guide, evaluator, mentor and trainer for the CCAfrica/andbeyond group. Mike also has FGASA qualifications. Some of the Specialist Safaris that Mike conducts are leopard research, white rhino darting, photographic safaris, specialist birding safaris, big cat safaris, predator safaris, bush skills and 7 wonders in 7 days (Phinda only). He won the Munyawana Ranger of the Year award in 2004 and the CCAfrica Ranger of the Year award in 2007. These prestigious awards of course made him the CC Africa/andbeyond Ranger of choice to conduct the safaris of any high profile clients. He has also had a long standing relationship with thelocal community hence his in-depth involvement with the communities. Mike has also experienced parts of East Africa such as Kenya and Tanzania, exploring the wonders of the great migration and the magnificence of Ngorogoro Crater. He has conducted ranger training at Matetsi in Zimbabwe and at Sossusvlei in Namibia. One of his favorite pastimes, is enjoying sundowner drinks on the banks of the Khwai River in Botswana…..
Mike has recently been sponsored by Nikon SA to be an ambassador for the brand because of his photography and passion for the industry of guiding. Whether you want to specialise in photography, birds, habitats, animal behaviour or even just spend quality time at one sighting, this all becomes an option with having a specialist ranger privately hosting you on your safari! Tanya Kotze as a Tour Operator has vast experience of personally visiting hundreds of lodges and hotels in order to be able to sell top quality products with confidence because of the fact that one cannot believe everything on the web or from what you see in a brochure. This dedicated approach of quality assurance has earned her the respect and regular return business in organising top quality, fun, value for money and perfectly balanced visits to Southern Africa. After completing her honours degree in Sociology, Tanya soon realised that it was time to follow her heart, and become part of Africa’s growing tourism industry. To her there is nothing as special as the African Bush with its unique fauna and flora, and to say that she is passionate about Africa’s Big 5 would be an understatement! She has personally visited more than 50 of Africa’s “Big 5” lodges during the past few years. There is no one with more personal experiences of luxury game lodges in South Africa than her. Tanya is a very keen birder – with her personal list exceeding 600. Her husband, Hilton, is an award winning wildlife photographer, and Tanya has arranged numerous wildlife photographic safaris for numerous clients wishing to capture that perfect shot! Tanya believes in tailor making every itinerary according to every client’s specific needs. Most people travel a very long way to get to Africa, and she believes in giving priority to your specific needs and interests, to ensure that your vacation is the best it could possibly be! Contact Tanya today, so that she can start tailor making your vacation of a lifetime! After several years in the Professional Hunting industry, Greg turned his interests toward the photographic safari and guiding industry and became a Professional Field Guide. Greg has attained one of the highest qualifications through the Field Guides Association of Southern Africa (FGASA) with a Level 3 SKS in Dangerous Animals, a Level 3 Tracker as well as having a degree in Nature Conservation attained in Cape Town. Greg has worked in various of the country’s leading game reserves and lodges, including leading walks in the world famous Kruger National Park. Throughout Greg’s guiding career, he has been interviewed on television, been mentioned in articles pertaining to his guiding and has had photographs published in articles all over the world. He has guided celebrities to the likes of John Travolta, Kate Moss, Lily Allen, as well as the Prime Minister of Kenya, Mr. Raila Odinga and the president of Gabon, Mr. Omar Bongo to mention a few. In 2009 Greg was invited by the South African Tourism Board to enter the prestigious Welcome Awards for 2010. He went on to win the Welcome Awards for the National sub category for 2010. 2010 saw Greg’s picture on billboards throughout the country. Appearing at the newly opened Gautrain stations in Sandton, Johannesburg and OR Tambo International Airport to mention a few, welcoming visitors from around the world arriving for the 2010 FIFA World Cup, proudly being hosted by South Africa. Greg was again invited to enter the Welcome Awards the following year for 2011 in further recognition of his efforts to “…raise the bar on service delivery…” within the South African Tourist Guiding and Tourism Industry. Greg was later also nominated anonymously and entered into South Africa’s first ever “Ranger of the Year” competition, arranged and sponsored by AFRICA DIRECTand FGASA. All aspects of guiding was tested, observed and evaluated by a panel of well-known and celebrated members of the industry and guides on the judge’s panel. Various topics and subjects were addressed, including shooting, tracking, story telling, birding, bush walking and many more tests and evaluations. Greg became South Africa’s very first “Ranger of the Year”, after winning the title amongst his peers, his friends and colleagues. The event was also televised in order to bring about better exposure to the guiding and tourism industry. The title was “In recognition of Professional Field Guides as true custodians and ambassadors to ourwildlife” and he has been invited to return for the 2012 Africa Direct/FGASA Ranger of the Year competition as a judge in the competition. Greg is currently studying further within the guiding and conservation industry in order to better himself further in making his guiding experience an unrivalled one inAfrica. He also sat on the FGASA Executive Committee and is an active mentor to many younger guides within the industry and has also been involved with the African Safari Lodge Foundation where he was on the selection panel involved in selecting promising underprivileged individuals from local communities who were then given the opportunity to be trained as Professional Field Guides, many of whom are now fully qualified guides and have jobs in the bush throughout South Africa. Going on an Africa Direct Private Guided Safari with Greg Lederle, is guaranteed to be a highly educational, fun filled experience! Jaco Buys decided at the ripe age of 4 years old that he was going to become a game ranger. This decision was made on one of the Buys family’s annual trips to Kruger National Park. It was the family’s first visit to the beautiful Northern sections of the Park and seeing a Leopard attempting a failed hunt on a Nyala Bull as well as Shawu, one of the Magnificent 7 Elephant Bulls, created indelible memories. Jaco is 17 years into his career as Game Ranger and Field Guide. He has had the privilege of working in Kenya, Tanzania, Zambia, Malawi, Zimbabwe, Botswana, Namibia and South Africa. The theme of experiencing and enjoying memories, memories that will outlast time, now a passion that can be shared with guests from all over the world. Memories like searching for and finding the famous Wildebeest and Zebra migration in Northern Serengeti, walking into Leopards mating in Lower Zambezi, swimming in the crystal clear waters of Lake Malawi and tracking 13 Lions in the Okavango Delta. Jaco and his wife, Laurika, spent 5 years in Botswana, walking in the Delta and doing safaris through the National Parks. 7 years followed managing Chitwa Chitwa Safari Lodge and Simbambili Game Lodge in the Northern Sabi Sand Game Reserve. The Sabi Sand offered opportunities to learn from the animals, as their habituation to vehicles offered close encounters allowing undisturbed behaviour. Many special moments were shared with many special guests and guests started returning to the area and on safari as friends. Guiding developed into a recognised profession and Jaco is registered with the Southern African Field Guides Association as a Level 3, Lead Trials Guide. He has also completed the Assessor’s qualification and has mentored and trained trackers and guides. The Association requires all guides to keep a record of their sightings of potentially dangerous animals encountered on foot. Jaco has had the privilege of encountering Leopard on foot 428 times, found Lion on 386 occasions and has well over 350 sightings each of Elephant, Buffalo and both Black and White Rhino. Jaco believes though that the focus must always remain on the guests, the experience that nature offers at any particular time and place and a guide’s attempt to interpret and share the beauty and wonder of Africa. We invite you to visit Africa on a Private Guided Safari with Jaco, and to see the bush through this very accomplished Game Ranger’s eyes! Hilton Kotze is a dynamic wildlife and sports photographer, with an exceptional passion for Africa and its wildlife. His 12 years of experience in the bush, love of people and his ability to share his knowledge make him a very successfulphotographic host. Hilton has had the great fortune to travel to some of the most remote and sought after wildlife and photographic destinations in Southern and East Africa including, Botswana, Namibia, Zambia, Kenya and Tanzania, these travels have enabled him to capture some of the most special moments nature has to offer. Hilton’s immediate background is in the Health and fitness industry; here he uses his love of people, great personality and fantastic communication skills to help people from all walks of life to live a better life. It is these very attributes that make Hilton a great photographic host, together with his ever growing love and passion for nature and wildlife and his wealth of photographic knowledge, Hilton is able to assist his guests to seize the moment and capture creative, unique and exciting images while growing their own passion for nature and photography. Hilton is also very familiar with both major brands of equipment, Nikon & Canon and is able to assist with both. When Hilton isn’t chasing those magical bush moments or hosting photographic safaris, he is busy capturing our sporting hero’s making history in various sporting events. Brendon Cremer was born and raised in Zimbabwe. He was exposed to wildlife and the outdoors form a young age, he could hardly be kept indoors, nature already had a big place in his heart and life. Brendon went to school a Peter House in Zimbabwe, where he built on his passion for nature, he was involved in and eventually headed up the Falconry club as well as being very much involved in the conservation and research of the school own game reserve. Brendon work in the Kariba area and in Matusadona national park during his school holidays, building on his knowledge of wildlife. On the onset of political strife and the collapse of the Zimbabwean economy Brendon returned to his families native land South Africa. Here he met his lovely wife Michelle. Brendon and his wife went to work as a Lodge managers in the world renowned Sabi sand game reserve, Brendon spent 4 years in the game reserve capturing on camera everything the reserve has to offer, but paid special and close attention to the big cats of the reserve, Brendon has an extensive knowledge and understanding of big cats, their habits, and habitats and is one of Brendon’s big passions. Today after spending 13 years in the bush, Brendon is an adventurer, conservationist, photographic host and wildlife photographer, based in Nelspruit. On the safaris that Brendon hosts and through his passion for photography and wildlife together with his profound knowledge, deep respect and understanding for Africa and its wildlife, Brendon’s guests not only enhance their photography, but also gain a lifelong admiration for Africa’s wildlife and culture. Predicting animal behaviour is essential to ‘getting the shot’ as Brendon often proves and he always does his best to get his guests in to the right position for that magical shot. Brendon is familiar with both the Nikon and Canon Brands so is able to assist with both. Nicole Justus is heads up the European Agency of Africa Direct. After finishing her degree on Landscape Architecture and adding a business specialist degree she moved with her family to the USA. During her years in the U.S.A she made numerous self organized trips through the U.S.A and Canada. As the next step, she and her husband, Markus, moved to South Africa and lived there for several years. During this time, Nicole continued to organize different trips, partly already dealing with Africa Direct, to discover South Africa and Botswana. After those trips she got infected with the ‘Virus’ called Africa and now truly loves the country and its’ people! Nicole has also become an enthusiastic amateur photographer. The experiences in the African bush were unique and the endless variety of animals and birds in Africa continue to amaze her. In Europe most of the animals are only known to Europeans from watching wildlife documentaries or visiting the zoo. How different is the experience if a lion or an elephant approaches without a fence in-between! Sitting on an open off-road game viewing vehicle, one gets such a huge adrenaline rush when looking into the eyes of a lion or the car nearly gets touched by the trunk of an elephant. It is a very unique experience and we hope to enable as many people as possible to share in this amazing experience! Based on the very positive experiences with Africa Direct in organizing her private trips through Africa, Nicole decided to open an European Agency of Africa Direct after her return to Germany, where she continues to utilise the full back up service of the offices in South Africa! After completing his M.Sc. degree in Fisheries Science, Gary Lyon, was looking for adventure and more time outdoors, to enjoy his passion for wildlife. His first break came when he answered an advert for a wildlife guide at Loskop Dam Nature Reserve, in Mpumalanga, South Africa. This was to be the beginning of his career as a wildlife guide. After leading game viewing trips for several years, mostly by boat, he was offered a job at The Chobe Reserve, in Botswana, where he acted as a senior guide and interpreter for Into Africa Mowana Safaris. He led game viewing trips along the Chobe and Zambezi Rivers, by boat and by four-wheel drive vehicle. 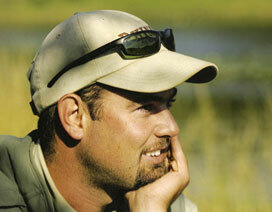 During this time he earned a top level Botswana Professional Guides’ License. It was here that he honed his guiding skills under the tutelage of individuals likeRichard Randall (an expert birder) and John Locke, one of the first wildlife guide trainers for the Field Guides’ Association of Southern Africa (FGASA). On returning to South Africa, Gary travelled extensively and lived in Cape Town for a while before working with Outward Bound South Africa as an outdoor instructor and course coordinator, leading courses involving climbing, hiking, canoeing, kayaking and high ropes work. As a senior guide at Inyati Private Game Reserve, in theSabi Sands, he achieved his Level III guide’s license and then obtained the Special Knowledge and Skills-Dangerous Animals (SKS-DA) qualification, writing the exam with FGASA and then completing an assessment under THETA. He also worked for Drifter’s Adventours, where he led tours around southern Africa and ran their Wildlife Guide Training Course. Gary has travelled throughout Africa including, Uganda, Ethiopia, Mali, Ghana, Botswana, Zimbabwe, Namibia and Zambia, primarily to see wildlife but also to appreciate the striking and magnificent cultures in Africa. He likes all things leafy, feathery, scaley and hairy. Gary is currently living in New York, with his wife Cyndi, an American, whom he met in Botswana. He teaches environmental education and acts as a representative for Africa-Direct in the United States. We have found the secret recipe for making the most unforgettable safari experience and we would love to share it with you by trusting in us to look after all your planning and safari requirements!